One of the noblest of the campfire chords, the poor D major has fallen victim to some of the worst examples of sub-Dylan folky jangle. Let it enjoy its old age in peace, while you search elsewhere for your exciting new sounds! 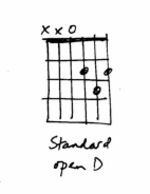 As we've mentioned before, you can always add the 9th to a major or minor chord. However, if you use the 9th to replace the 3rd, you get a sus2, which is ambiguously neither major nor minor and therefore incredibly versatile. Remember the three-string Am7/Am6 funk chord we covered a while back? Well here's a little friend for it... a one-finger D6 shape. Perfect for those Nile Rodgers moments - of which there are plenty.